I don’t do many book reviews here on my blog. I read a lot of books, some good, some bad and some great but I usually leave the book reviews to others. Today is an exception. A week or two ago I received my copy of Photoshop Compositing Secrets. Unlocking the Key to Perfect Selections & Amazing Photoshop Effects for Totally Realistic Composites by Matt Kloskowski. When you create a composite, you are taking various pieces and putting them together to make a whole. This might be a model shot in the studio transported to grungy warehouse or creating a concert stage shot from a combination of stock images and a model shoot, or even using the same image twice in an interesting way. But in every case, you have to pay attention to how the pieces combine to create something that is more than just the sum of the parts. In other words you need to have a plan. Chapter after chapter, this book shows you examples of creating images that took real planning. Matt didn’t just sit down and throw something together, he planned it out from what pose to have the model in to the focal length used for the background so that it matched the focal length used for the subject and much more. For the Photoshop user one of the hardest things to master is making a great, natural looking selection. This book will really help with that and even goes as far discussing the best backgrounds to shoot against when in the studio. It is this attention to all the details thus makes this book so good. The one warning I have is that if you have a version of Photoshop that is pre CS5 you will be disappointed. Many of the selection tools in CS5 are new and are what makes part of the this possible. 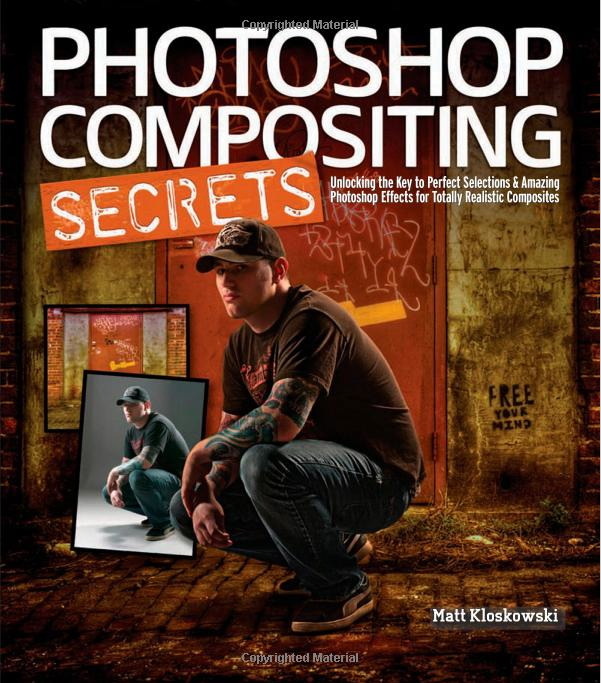 So if you want to see some great Photoshop composites and what to learn how to do them, this is the book for you.